The Hammerhead 2015 trader list has been updated; Ancient and Modern/Donnington Miniatures, Early War Miniatures, Great Escape Games, Hawk Wargames, Miniature Wargames with Battlegames, Shellhole Scenics and Wargames Illustrated. All available trade space around the perimeter has been allocated. The central area of the exhibition hall has been reserved for participation games and tabletop sales. We will endeavour to accommodate any clubs, groups etc. that want to come along and run a participation game. Please contact Sally through the Hammerhead show website for details. 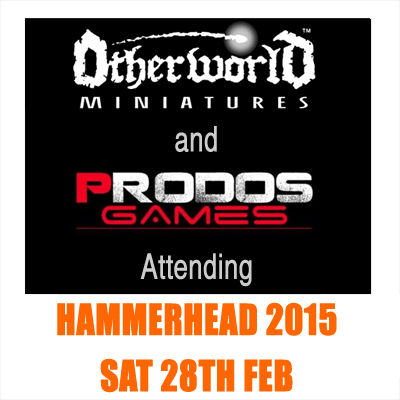 We are pleased to announce that Otherworld Miniatures and Prodos Games have confirmed their attendance at Hammerhead 2015.